I’m one happy fella with a dish of Paella!! April 3, 2015 April 3, 2015 ~ Trevis Dampier Sr. The dish Paella is said to to be a perfect union between 2 cultures from Spain , the Romans, for the pan and the Arab, that brought rice. I don’t even know where to begin with this as my experience came as an accidental treasure discovery when meeting my fiance Virginia for drinks at one of our favorite Spanish restaurants. The mission was to engage ourselves with Caipirinha’s and Margaritas but not to be hypnotized by this wicked pot of gold. Virginia was hungry so she decided to order something different and when this order of delectable sensation arrived; I thought to myself..hmmm. Looks tasty. How about a little bite. Yum! Wow the chicken is so tender. MMmmm! What are all of these textures.. It’s so good.. Bite after bite, taste after taste..This is scrumptious!! What is this mythical creature and where does it hold its roots from? It is called the Paella Rustica which contains lamb, chorizo, chicken, morcilla, green beans, piquillo peppers and sofritto. I feel like I am wearing the Mask of Zorro when I eat this dish. I am alive! I am powerful! I am bold, I am strong! This dish represents all of that and honestly the small portion of it can be eaten by 4-5 people. It fills you up quickly and does the job of making you extremely satisfied by taste and stomach fill. 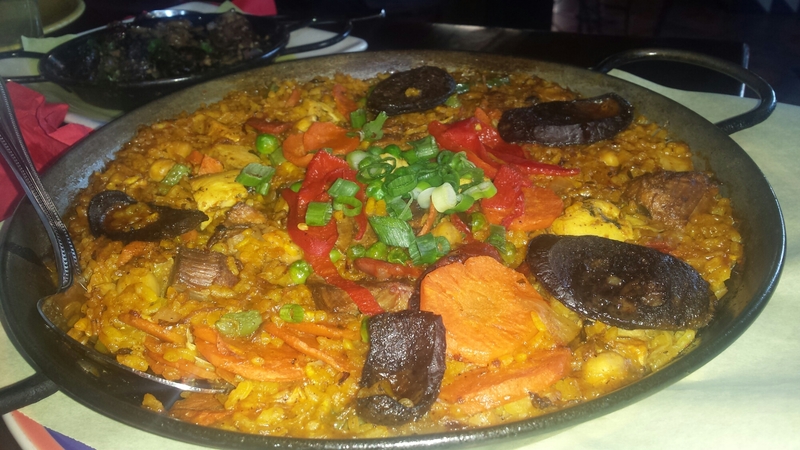 If you haven’t experienced a ride on the Paella train, then I highly suggest you jump on board. You will not be disappointed! Thanks for joining me on today’s wild adventure! I look forward to seeing you on the next run. Keep hope alive! < Previous I’ll Cheerlead with Pom Poms for BBQ from Jon Jon’s!! Next > Happy Easter everyone! What’s on your dinner plate?